40G bandwidths are now being widely adopted within LANs and Data Centres. 100G is still predominantly in the carrier network, but could soon be required within your local network. There is still much confusion as to what type of fibre network is required to accommodate these newer bandwidths. Below we look at the differences between OM3 and OM4 and also the differences between transmitting a parallel optic signal (40G and 100G) and duplex one (10G). What exactly is the difference between an OM3 and OM4 fibre network? » the connectors are the same » the termination of the connectors is the same » the transceivers are the same (both operate 850nm VCSELS (Vertical-Cavity Surface-Emitting Lasers) » the fibre core size 50/125 is the same » both fibres are Laser Optimised Multimode Fibre (LOMMF). OM3 is fully compatible with OM4. So the difference is just in the construction of the fibre cable. The difference in the construction means that OM4 cable has better attenuation and can operate at higher bandwidth than OM3. Below we explain these. Correct functioning of an optical data link depends on modulated light reaching the receiver with enough power to be demodulated correctly. There are 2 aspects to this: Attenuation and dispersion. Attenuation is the reduction in power of the light signal as it is transmitted (dB) Dispersion is the spreading of the signal in time due to the differing paths the light can take down the fibre. Attenuation is caused by losses in light through the passive components, such as cables, cable splices, and connectors. As mentioned above the connectors are the same so the difference in OM3 and OM4 performance is in the loss (dB) in the cable. There are two types of Dispersion: chromatic and modal. Chromatic is the spreading of the signal in time resulting from the different speeds of light rays. Modal is the spreading of the signal in time resulting from the different propagation modes in the fibre. In multimode fibre transmission, chromatic dispersion is negligible and so it’s the modal dispersion that is the limiting factor. Attenuation is much simpler to explain and so we will deal with this first. OM4 causes lower losses due its construction. The maximum attenuation allowed by the standards is shown below. You can see that using OM4 will give you lower losses per metre of cable. The lower losses mean that you can have longer links or have more mated connectors in the link. Light is transmitted at different modes along the fibre. Due to the imperfections in the fibre these modes arrive as slightly different times. As this difference increases you eventually get to a point where the information being transmitted cannot be decoded. This difference between the highest and lowest modes is known as the modal dispersion. The modal dispersion determines the modal bandwidth that the fibre can operate at and this different between OM3 and OM4. Modal bandwidth represents the capacity of a fibre to transmit a certain amount of information over a certain distance and is expressed in MHz*km. The higher the modal bandwidth the more information can be transmitted. Note – Differential modal delay (DMD) is the method for testing modal dispersion – it tests the difference in arrival of the higher modes compared to the lower modes. So what does OM4 give you that OM3 doesn’t? So we now know that OM4 cable has a lower attenuation and operates at a higher modal bandwidth. Both these factors mean that less power is lost in the transmission of the signal and that means the signal can be transmitted further or through more connector pairs (which add to the losses). Based on the IEEE 802.3ae networking standard, OM4 gives longer link lengths for 10Gb/s, 40Gb/s and 100Gb/s as well as for InfiniBand and Fibre Channel applications. The table below shows these distances based on the standards. 40G signal is transmitted across eight pairs of fibre each with 10G. Similarly, 100G is transmitted across ten pairs of fibre each with 10G. So why can you not transmit these multiple 10G signals as far as a single 10G signal? What is the cost difference between OM4 and OM3? As mentioned previously, the only difference between an OM3 network and an OM4 network is the actual fibre cable. Therefore, the primary cost increase arises from this. The cost for OM4 is greater due to the manufacture process and also due to economies of scale that the production of OM3 benefits from due to the volumes currently produced*. Costs vary depending on the construction type of the cable (loose tube, tight buffered, dry loose tube micro core cable). However, a good rule of thumb is that OM4 cable is about twice as expensive as OM3 cable*. 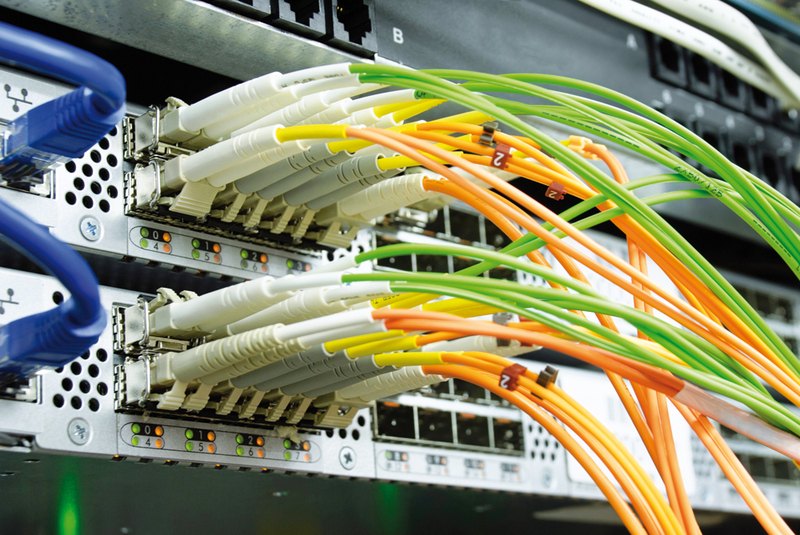 This means that for lots of products such as standard fibre patch panels, MTP cassette modules, fibre patch cords the cost difference is very small (as the volume of cable is small). The cost difference starts to build up as the backbones/trunks get longer and the core counts get higher. The main consideration aside from costs is the availability of standard product. As OM3 is much more widely used than OM4* there is a greater range and depth of standard product available. However, for factory manufactured pre-terminated solutions the availability is now similar due to the increase in the demand for 40G and 100G. As mentioned above OM3 and OM4 are completely compatible. So it is completely viable to mix OM3 product with OM4 and still obtain the required performance. Although many network managers like to keep to one standard across their multimode network there is no reason why a combination of OM3 and OM4 links cannot be used across a single network. So the key questions you need to ask? OM3 and OM4 both offer performance at distances most often required in LANs. OM3 offers a significantly reduced spend. 40G is four 10G channels transmitted over 4 pairs of 10G fibre. 100G is ten 10G channels transmitted over 10 pairs of 10G fibre. Why is the standard for 40G only 100m on OM3 and 150m on OM4 compared to 300m and 500m for 10G? The answer is that when the IEEE 802 standard was created they decided to create a standard based on “relaxed” transceiver specifications so that smaller and lower cost transceivers could be used. The main relaxation of the standard was an increased loss allocation for JITTER. Two functions which are present in 10G transceivers (clock recovery and attendant re-timing) are absent in both QSFP+ (40G) and CFP (100G) devices. Using transceivers that are better than minimal compliance enables greater distances such as over 200m on OM4. Using these types of transceivers not only enables greater distances than the standard but also enables more MTP connected pairs. For example, when using MTP ELITE connectors it is possible to have up to 6 connections (mated pairs) which is way outside the IEEE standard. As mentioned above, 40G and 100G are transmitted as multiple 10G signals. It is therefore possible to transmit these bandwidths over a fibre network that was designed for 10G. For example, if you needed to use existing LC fibre patch panels and backbones to transmit a 40G signal you would need 4 pairs of fibres between the Tx and Rx points. To connect these LC patch panels to the 40G QSFP+ ports MTP-LC breakout cables would be used at both ends. However, when doing this it is important to understand the impact of running a parallel signal across multiple separate duplex fibres in your backbone. The decision to use OM3 or OM4 is similar to the decision making process with standard 10G network. There are additional factors to consider to take into account such as the reduced transmission distances, the number of cross connects required and the mix of 40G port to 40G port and 40G port to 10G port. Similarly, it is important to take into account the likely location of future 100G equipment and the possible 100G to 100G, 100G to 40G and 100G to 10G connectivity requirement. Complete Connect can help with your 10G, 40G and 100G fibre network. Our comprehensive range of products in OM3 and OM4 offer customers the ability to create the optimal network. Thinking of upgrading your fiber backbone? Need some assistance or just some information?